living, and loving learning: why can't we just respect our differences? why can't we just respect our differences? I realize that this post is a bit different from what I normally post here, but I just needed to get it off my chest. As we were sitting talking about Banned Books Week the other day, it dawned on me just how many banned/challenged books Annie and I read for school. It's not that we single them out for that reason; it's just that so often the books that deal with the tough, real-world issues are the ones that some feel the need to try to keep others from reading. And yes, I admit that I often pick our mutual reads just because of the discussions I know they will lead to. I don't for a minute think I have any right trying to dictate what another family might choose to allow their children to read at any given age. Annie and I read To Kill a Mockingbird when she was ten, but I can understand that not every child might not be ready to tackle some of the issues in that book at that age. When my boys reach that age, I may not feel they're ready. Not that I would stop them from reading it if they felt the desire to, but I can't yet say I will be recommending it for them at that age either. Each child is an individual, with their own needs and their own desires! And no two families are identical; they each have their own varying values and histories and financial situations and support systems, etc., etc., etc. And that's why the efforts of some to keep books off the shelves of public libraries is so upsetting. Are there books that turn my stomach? Sure. That doesn't mean that I will try to keep anyone else from reading them. And this whole issue of the right to choose what's right for our children and our families extends far beyond the shelves of our local libraries. In this country, it is legal to homeschool our children. (The number of hoops you must jump through varies from state to state, of course.) But just because it's legal, that doesn't mean one won't constantly be judged. When we pulled Annie out of public school, we expected to receive some flack from people. And we did. Because there are people who always think they know better. Doesn't even seem to matter that they don't personally know your child or the situation in general. Refer back to words in bold! The thing we didn't expect was the vitriol we sometimes receive from other homeschooling families because Gray and Max are in public school. How can it be that some of the people who argue so strongly and passionately for their right to educate their children in the manner they find appropriate, can turn around and so easily dismiss others' rights to do the same? 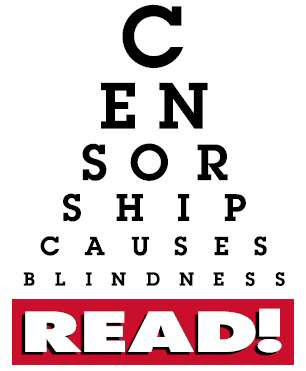 --Yes, I allow my children to read banned/challenged books. We're a family of readers, and the discussions that follow from reading books are some of the most wonderful discussions we have. --Yes, I have two children in public school and one child who is homeschooled. We weigh the pros and cons of all available educational options for each of our children individually. We take into strong consideration their personal desires. We reevaluate regularly. --Yes, I have two children who choose to be vegetarians. We make sure they eat a healthy, well-balanced diet. --Yes, we will be getting our children flu shots. Two of our children have "lung issues," so the potential negatives of the flu vaccine pale in comparison to the potential effects the flu could have on them. You can accept my brief explanations or not. But they are our decisions to make. I will try my hardest not to second-guess your decisions for your family, and I'd like to hope you will do the same for me. And hey, Happy Read Banned Books Week! Because there are people who always think they know better. As usual, I agree with you one hundred per cent! You rock, Debi! Keep up the good parenting work ... and play! Debi - how in the world did I not know about this blog?? I'm subscribing asap!